Greg was the only one who answered my plea for company out at Kahana today. I probably would have flown by myself anyway, but I don't think I would have gone XC. We launched low and boated around in strong smooth lift over the bay for a while, chatting on the radio with Don, who was flying at Makapuu. At one point I managed to cross the bay but couldn't stay up over Crouching Lion, so I scrambled back super low. After I got back up, we decided to try the other way, and we found smooth strong ridge lift at both the Punaluu and Hauula ridges. We could have easily blasted downwind to PCC or BYU but I really prefer Pounders. And it was Greg's first time landing there. He set up a very nice landing in what turned out to be super strong wind down there. Great job, Greg - and thanks again for coming out today! Sure wish I could have gotten away from the muck and joined you guys. Greg's chatter says you were stinkin' high -- so how high was that? Higher than typical Kahana? What was cloudbase? Please, I need to live vicariously for another week. My vario was out of juice so you should ask Greg to be sure. It wasn't one of those rare nice light days when cloudbase is at 4 grand and you can thermal up above the whole range. I know you've seen a few of those days. Yesterday was about as strong a day as I would pick to leave the ridge. 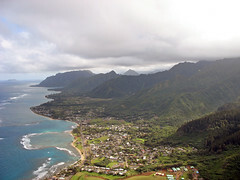 (We flew into the back at Kahana to get high but it was strong back there and slow going to get back out front.) Also the cloudbase was about as low as I'd want it to leave the ridge - 2500 or a bit lower I'd guess. It was a challenge to stay out of them at times. We'll have to ask Greg for some hard numbers. Sorry you couldn't make this trip, but somehow I think there'll be plenty more chances. Thank Ray! Part of this flight was a disappointment. I was at 1200 ft and nearly to the horn at crouching lion and watching Alex trying to work the lift after crossing the bay. He was not getting up and I realized that although I could get across the bay for the very first time EVER I would not be able to stay and get back up. I saw Alex leave and go racing back across the bay and followed. He looked so low I was wondering if he would make it back. He made it back fine, I was wondering what his pucker factor was, or if my height made him look a lot lower that he really was. Greg, don't worry, when it's a good day to cross the bay, you'll find that it's easy to cross AND easy to stay up over there. Just wait for a moderate day with more of a NE direction. I'll call you the next time it looks likely. On my way back from that attempt I was a bit worried about how low I was, and I was watching carefully to see I would need to cut back to the beach, but I got lift about halfway back and made it back up without too much trouble.